The Ankuoo Wi-Fi Light Switch lets you turn lights on and off from anywhere at any time. You can set schedule timer, countdown timer and anti-theft timers to fit your life style. You can add multiple switches to your home to control your lighting using our app. VOICE CONTROL: Works with Amazon Alexa. Ankuoo WIFI light switch with Amazon Alexa built-in devices to turn your lights on or off with just the power of your voice. 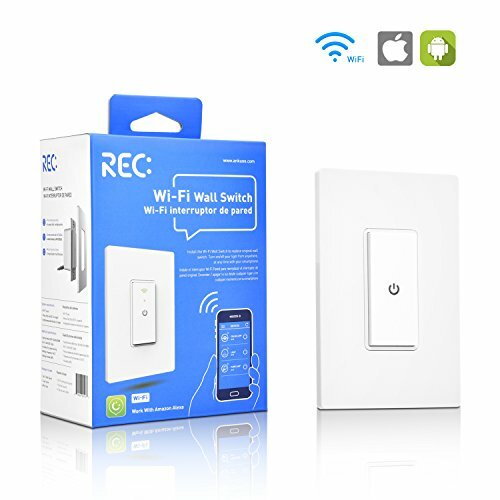 ROMOTE CONTROL: Control devices connected to the smart switch anywhere with your tablet or smartphone using the free Rec app (Compatible w/ Android 4.0 or higher & iOS7.0 or higher). RANDOMIZE LIGHTS TO PROTECT YOUR HOME: Enable "Antitheft-Mode"when you're away and Ankuoo will turn lights on and off randomly. NOTE: Refer user manual, installation guide and video before use. If you have any questions about this product by Ominihome, contact us by completing and submitting the form below. If you are looking for a specif part number, please include it with your message.